Occasionally events occur that remind that cricket is just meaningless entertainment. Today is one such day. It’s obvious that the systems that structure humanity are changing. No longer do the elitist minority have absolute control of information. Their reaction to this shift is as predictable as it is criminal. A few hours ago, Sandmonkey, an Egyptian blogger of some repute, disappeared delivering medical supplies to Tahrir Square and his entire blog containing all his writings and rantings has been wiped from the ‘net. He knew the risks and even prophesized his demise. Hopefully, his sacrifice will not be in vain. Below is Sandmonkey’s latest post, an eyewitness acount of events in Cairo. It is presented to show solidarity with a fellow blogger but most of all as a mark of respect to a man with the courage and character to stand up for a fair go. I don’t know how to start writing this. I have been battling fatigue for not sleeping properly for the past 10 days, moving from one’s friend house to another friend’s house, almost never spending a night in my home, facing a very well funded and well organized ruthless regime that views me as nothing but an annoying bug that its time to squash will come. The situation here is bleak to say the least. It didn’t start out that way. On Tuesday Jan 25 it all started peacefully, and against all odds, we succeeded to gather hundreds of thousands and get them into Tahrir Square, despite being attacked by Anti-Riot Police who are using sticks, tear gas and rubber bullets against us. We managed to break all of their barricades and situated ourselves in Tahrir. The government responded by shutting down all cell communication in Tahrir square, a move which purpose was understood later when after midnight they went in with all of their might and attacked the protesters and evacuated the Square. The next day we were back at it again, and the day after. Then came Friday and we braved their communication blackout, their thugs, their tear gas and their bullets and we retook the square. We have been fighting to keep it ever since. That night the government announced a military curfew, which kept getting shorter by the day, until it became from 8 am to 3 pm. People couldn’t go to work, gas was running out quickly and so were essential goods and money, since the banks were not allowed to operate and people were not able to collect their salary. The internet continued to be blocked, which affected all businesses in Egypt and will cause an economic meltdown the moment they allow the banks to operate again. We were being collectively punished for daring to say that we deserve democracy and rights, and to keep it up, they withdrew the police, and then sent them out dressed as civilians to terrorize our neighborhoods. I was shot at twice that day, one of which with a semi-automatic by a dude in a car that we the people took joy in pummeling. The government announced that all prisons were breached, and that the prisoners somehow managed to get weapons and do nothing but randomly attack people. One day we had organized thugs in uniforms firing at us and the next day they disappeared and were replaced by organized thugs without uniforms firing at us. Somehow the people never made the connection. Despite it all, we braved it. We believed we are doing what’s right and were encouraged by all those around us who couldn’t believe what was happening to their country. 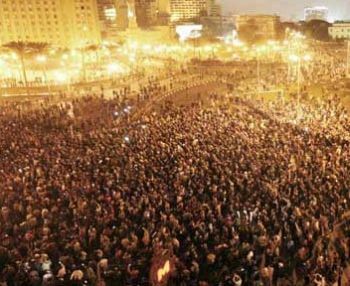 What he did galvanized the people, and on Tuesday, despite shutting down all major roads leading into Cairo, we managed to get over 2 million protesters in Cairo alone and 3 million all over Egypt to come out and demand Mubarak’s departure. Those are people who stood up to the regime’s ruthlessness and anger and declared that they were free, and were refusing to live in the Mubarak dictatorship for one more day. That night, he showed up on TV, and gave a very emotional speech about how he intends to step down at the end of his term and how he wants to die in Egypt, the country he loved and served. To me, and to everyone else at the protests this wasn’t nearly enough, for we wanted him gone now. Others started asking that we give him a chance, and that change takes time and other such poppycock. Hell, some people and family members cried when they saw his speech. People felt sorry for him for failing to be our dictator for the rest of his life and inheriting us to his Son. It was an amalgam of Stockholm syndrome coupled with slave mentality in a malevolent combination that we never saw before. And the Regime capitalized on it today. Today, they brought back the internet, and started having people calling on TV and writing on facebook on how they support Mubarak and his call for stability and peacefull change in 8 months. They hung on to the words of the newly appointed government would never harm the protesters, whom they believe to be good patriotic youth who have a few bad apples amongst them. We started getting calls asking people to stop protesting because “we got what we wanted” and “we need the country to start working again”. People were complaining that they miss their lives. That they miss going out at night, and ordering Home Delivery. That they need us to stop so they can resume whatever existence they had before all of this. All was forgiven, the past week never happened and it’s time for Unity under Mubarak’s rule right now. To all of those people I say: NEVER! I am sorry that your lives and businesses are disrupted, but this wasn’t caused by the Protesters. The Protesters aren’t the ones who shut down the internet that has paralyzed your businesses and banks: The government did. The Protesters weren’t the ones who initiated the military curfew that limited your movement and allowed goods to disappear off market shelves and gas to disappear: The government did. The Protesters weren’t the ones who ordered the police to withdraw and claimed the prisons were breached and unleashed thugs that terrorized your neighborhoods: The government did. The same government that you wish to give a second chance to, as if 30 years of dictatorship and utter failure in every sector of government wasn’t enough for you. The Slaves were ready to forgive their master, and blame his cruelty on those who dared to defy him in order to ensure a better Egypt for all of its citizens and their children. After all, he gave us his word, and it’s not like he ever broke his promises for reform before or anything. Then Mubarak made his move and showed them what useful idiots they all were. You watched on TV as “Pro-Mubarak Protesters” – thugs who were paid money by NDP members by admission of High NDP officials- started attacking the peaceful unarmed protesters in Tahrir square. They attacked them with sticks, threw stones at them, brought in men riding horses and camels- in what must be the most surreal scene ever shown on TV- and carrying whips to beat up the protesters. And then the Bullets started getting fired and Molotov cocktails started getting thrown at the Anti-Mubarak Protesters as the Army standing idly by, allowing it all to happen and not doing anything about it. Dozens were killed, hundreds injured, and there was no help sent by ambulances. The Police never showed up to stop those attacking because the ones who were captured by the Anti-mubarak people had police ID’s on them. They were the police and they were there to shoot and kill people and even tried to set the Egyptian Museum on Fire. The Aim was clear: Use the clashes as pretext to ban such demonstrations under pretexts of concern for public safety and order, and to prevent disunity amongst the people of Egypt. But their plans ultimately failed, by those resilient brave souls who wouldn’t give up the ground they freed of Egypt, no matter how many live bullets or firebombs were hurled at them. They know, like we all do, that this regime no longer cares to put on a moderate mask. That they have shown their true nature. That Mubarak will never step down, and that he would rather burn Egypt to the ground than even contemplate that possibility. In the meantime, State-owned and affiliated TV channels were showing coverage of Peaceful Mubarak Protests all over Egypt and showing recorded footage of Tahrir Square protest from the night before and claiming it’s the situation there at the moment. Hundreds of calls by public figures and actors started calling the channels saying that they are with Mubarak, and that he is our Father and we should support him on the road to democracy. A veiled girl with a blurred face went on Mehwer TV claiming to have received funding by Americans to go to the US and took courses on how to bring down the Egyptian government through protests which were taught by Jews. She claimed that AlJazeera is lying, and that the only people in Tahrir square now were Muslim Brotherhood and Hamas. State TV started issuing statements on how the people arrested Israelis all over Cairo engaged in creating mayhem and causing chaos. For those of you who are counting this is an American-Israeli-Qatari-Muslim Brotherhood-Iranian-Hamas conspiracy. Imagine that. And MANY PEOPLE BOUGHT IT. I recall telling a friend of mine that the only good thing about what happened today was that it made clear to us who were the idiots amongst our friends. Now we know. Now, just in case this isn’t clear: This protest is not one made or sustained by the Muslim Brotherhood, it’s one that had people from all social classes and religious background in Egypt. The Muslim Brotherhood only showed up on Tuesday, and even then they were not the majority of people there by a long shot. We tolerated them there since we won’t say no to fellow Egyptians who wanted to stand with us, but neither the Muslims Brotherhood not any of the Opposition leaders have the ability to turn out one tenth of the numbers of Protesters that were in Tahrir on Tuesday. This is a revolution without leaders. Three Million individuals choosing hope instead of fear and braving death on hourly basis to keep their dream of freedom alive. Imagine that. The End is near. I have no illusions about this regime or its leader, and how he will pluck us and hunt us down one by one till we are over and done with and 8 months from now will pay people to stage fake protests urging him not to leave power, and he will stay “because he has to acquiesce to the voice of the people”. This is a losing battle and they have all the weapons, but we will continue fighting until we can’t. I am heading to Tahrir right now with supplies for the hundreds injured, knowing that today the attacks will intensify, because they can’t allow us to stay there come Friday, which is supposed to be the game changer. We are bringing everybody out, and we will refuse to be anything else than peaceful. If you are in Egypt, I am calling on all of you to head down to Tahrir today and Friday. It is imperative to show them that the battle for the soul of Egypt isn’t over and done with. I am calling you to bring your friends, to bring medical supplies, to go and see what Mubarak’s gurantees look like in real life. Egypt needs you. Be Heroes. Update: Sandmonkey is safe for now. He was ambushed by police and beaten. His car and possessions were confiscated. He is seeking medical treatment. His blog is back online. I don’t know what to say… had always read about such situations in the pages of history, but had never contemplated one from an individual’s point of view. If Mubarak’s regime wins this fight and he manages to rewrite history, I will be proudly in possession of a record that can prove history wrong! I hope Sandmonkey is okay and healing. I wish him best in his fight for the nation he loves… definitely more than Mubarak! Thank you for posting this – I really like this blog, but in the last few days the crisis in Egypt (up until the evacuation of US citizens, my girlfriend was living there doing research) and the hatefulness of Mubarak’s response to protests has been preoccupying me, rendering cricket, if not uninteresting, then rather inconsequential. Thanks for posting that Nesta. While I’m really happy to see that update and to know that a persuasive voice has not been silenced, it saddens me that so many have died already. I haven’t really followed the protests, but this post gave a real perspective of what the ground reality in the region is. Thanks Nesta. Next Saudi Arabia – well, maybe not. The equivocation of USA, EU etc is sickening. When history is in the making, real leadership decides what’s right and backs it. It depends on what backing you’re talking about. Relations with Egypt are on a knife’s edge given the peace accord with Israel, which to a large extent has been credited with restraining regional antipathy from escalating to a situation from where there is no going back. So diplomatically, the important question becomes can you risk losing this accord by supporting one party who might in all probability be crushed out by a ruthless dictator who at least plays by your rules for now. And already stories of the US’s involvement in the revolution have been circulating in the country in a bid to gain sympathy for the dictator, as mentioned in this post. Nor can anything more than hope that rights will be respected be expressed, far too often the west has been accused of playing international policeman and meddling. For real change to happen, it must come from within (as is happening now) until the resolve of one party breaks. As MKG said, first they ignore you, then they laugh at you, then they fight you and then you win, so hopefully the end is now in sight and the sacrifices will have made a new dawn possible. Good post, Nesta. Reminds one what true courage and determination are…words we perhaps loosely use in the context of sports. @achettup, I agree that real change can only come from within…but that doesn’t mean that powerful nations around the world should just helplessly watch on. At the very least, they could use the UN, or another collective platform, to insist that Egypt’s government lift the clampdown on Internet and telecom services and stop the attacks on the independent press. No one is expecting or asking the US or EU to effect another regime change. BP – that’s very much the view I take. And the US and others could stop sending the money and weapons now. Of course there’s risk when history is being made – but there’s more risk in standing by “apparently neutral” when every single person in the whole country knows that Mubarak rules at the consent of the USA. The “let’s be careful – not sure what might come next” kept Mandela in prison for years and the black population under the hideous heel of Apartheid for far longer than could have been the case. Sure South Africa’s history of the last 20 years is not one of unmitigated joy, but does anyone seriously argue that it isn’t worth it? My prayers are with these brave protesters.It is heartening to see normal citizens the world over support this movement, rising above all ideologies. I haven’t been following the protests closely till now, but I will, from now on. Valuable info. Lucky me I discovered your site accidentally, and I am stunned why this coincidence didn’t took place in advance! I bookmarked it.